The Green Terramesh containment reinforces the soil and enables the plant integration of vegetation. The Sao Paulo Catarina Executive Airport is one of the three commercial airports serving São Paulo, Brazil. 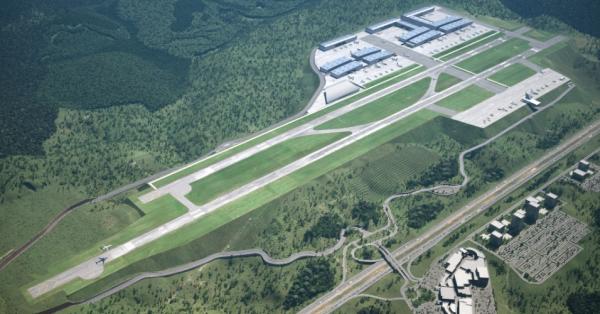 Located about 35 minutes from the State capital, at km 60 of the Highway Presidente Castello Branco, Sao Paulo Catarina Executive Airport is being built in an area of 5.2 million m². The exclusive focus on business aviation allows an operation of over 200,000 takeoffs and landings a year on a 2470 m runway. The airport will have an infrastructure to receive large business jets, such as the G650 and G550 models, Gulfstream, Global 6000 Bombardier models, or 8X Falcon and Falcon 2000 Dassault Falcon Aircraft. Currently, it finds itself in the final earthworks phase and will soon enter the building construction phase. Project engineers had to find a solution that facilitates the containment of a slope in a landfill in the western head of the runway in order to proceed with the project. It was not viable to reduce the runway platform, as the initial plan had been submitted to the evaluation of the National Civil Aviation Agency (ANAC). Maccaferri’s Green Terramesh solution was thus chosen to strengthen the soil via geosynthetics. This unique solution is an environmentally friendly modular system used to form vegetated (green) faced soil reinforced slopes (also known as Mechanically Stabilised Earth) and embankments. It has been used globally on some of the most significant infrastructure schemes. On taller slopes and structures, it can also be used in conjunction with our high-performance primary geogrids, ParaLink, ParaGrid, and MacGrid WG. The angled front face and the erosion-control blanket of the Green Terramesh solution enables the establishment of the natural vegetation of the units. The Green Terramesh unit consists of pre-fabricated units of double-twisted wire mesh (8×10 type), lined with an erosion-control blanket and stiffened with a welded mesh panel to speed up the construction process. The Terramesh systems has proven performance (displacements and deformations) in reinforced soil structures of this site, providing reassurance to the client. The technical proposal was prepared for the Retaining walls & soil reinforcement structures based on topographical surveys, ground investigations and soil reports. During construction instrumentation was installed to provide feedback and verification on the performance of the structure in-use and included both performance of the soil reinforcement elements, but the dimensional control of the structure. At the heart of the Green Terramesh unit is the single piece of double twisting steel wire hexagonal mesh which forms the soil reinforcement geogrid, the front face and the upper return; no connections are needed between the geogrid and the facing system. The steel mesh is coated in a GalMac zinc-aluminium alloy with a polymer coating to deliver a long design life. On taller structures, Maccaferri’s polymer geogrids, MacGrid WG, Paragrid and Paralink are used as primary soil reinforcement within these structures. For more information about Maccaferri’s Green Terramesh please contact us.